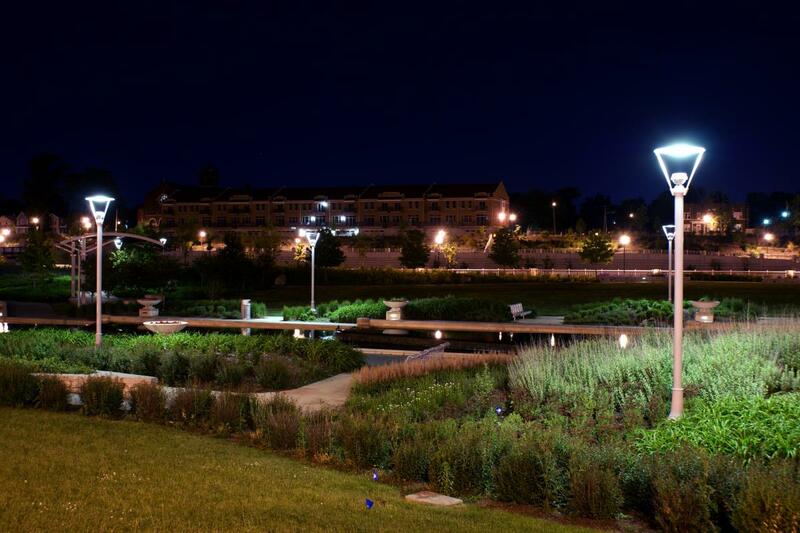 Beutter Park - The centerpiece of Mishawaka's 2000s downtown revitalization, the new park includes a river race with elliptical-shaped overlook weirs and fiber-optic underwater lighting, two connecting bridges across the St. Joseph River race to the park, the Mishawaka Riverwalk, the "Shards" sculpture, and an 800 foot perennial garden. Battell Park's historic WPA-built band shelter and terraced rock garden. Shiojiri Garden, located in Merrifield Park, is a Japanese strolling garden that symbolizes the Sister-City relationship between Mishawaka, Indiana and Shiojiri City, Japan. The Beiger Mansion, built in 1903 and beautifully restored in 1973, was gutted by arson in 1974. The building has since been re-renovated (although not to its former state) and is home to a popular area bed and breakfast. AM General's manufacturing plant, where the Hummer line of vehicles are built. Bethel College is affiliated with the Missionary Church, and serves approximately 2,000 students. Bonnie Doons restaurant on Lincoln Way West and Fourth Street at Main are the last of the area's original 1950s vintage drive up soda shops.